If you own land, a chain saw can be a great time and money saver. Instead of using an ax or calling in a landscaper to remove broken tree limbs, bring down dead trees, or cut firewood -- you can do it yourself. If you need a chain saw only once, consider a rental. Most equipment rental stores (and many hardware stores) rent chain saws. They usually rent for around $50 / day. However, if you anticipate using the saw more than once, a purchase might be the better choice. You won't have to rush through jobs. And you can be sure your saw is in top condition, i.e. a sharp chain, no mechanical problems. Avoid used chain saws. The time and energy you spend getting the saw to work correctly will outweigh any cost savings. In addition, newer saws have more safety features. With new gas saws starting at $100, it just makes more sense to buy new. Professional saws are made for daily use and are built to handle a great deal of abuse. Standard saws are similar to professional saws, but are designed to be more flexible in their application. Consumer saws are designed for occasional use and are less expensive than professional and standard grade chain saws. Most homeowners buy consumer saws. Fuel / Power - Chain saws are either electric or gas powered. Electric saws are typically less expensive, quieter to operated, cleaner, require less maintenance, but are limited in where they can be used due to the required power cord. Gas saws are typically more expensive, noisier, more powerful, and allow more flexibility in where they can be used. 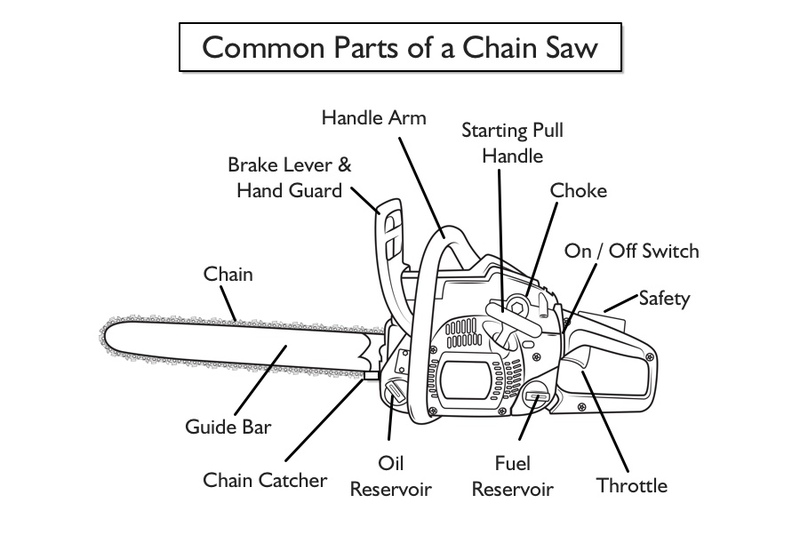 Most gas-powered saws have a two-stroke (i.e. two cylinder) motor that uses a special oil mixed directly into the gasoline fuel. A few rechargeable battery powered saws exist, but they lack the power for most jobs. Engine size - Larger engines can accommodate larger bars and get the job done faster. However, the weight of a saw increases as the engine size increases. Electric saws measure the engine size in amps, gas saws measure the engine size in displacement (cubic centimeters) or horsepower. Bar size - The bar is the metal extension that the cutting chain is wrapped around, bar sizes typically range from 14 to 20 inches. Shorter bars reduce weight and optimize the power of a saw. Choose a bar length that is best for the size tree that you will be cutting most often. You can cut a tree up to twice the length of the bar if necessary. Design - Look for a well-balanced saw body with a high center of gravity. Heated Handle - For use in very cold conditions, consider a saw with a heated handle. Serviceability - easy access to the air filter and spark plug. Also look for a side-mounted chain tensioning to save time and effort. Warranty - most saws come with a 1-year limited warrantee that covers parts and labor. Determine your required grade of saw based on frequency of use. Those needing a saw for constant use should consider a standard or professional saw. Occasional users should consider a standard or consumer saw. Determine the ideal power type. Buy a gasoline-powered chain saw if you need mobility or are cutting large logs. Electric saws are fine for small branches or light jobs. Verify the safety features and compare warrantees before making a purchase.